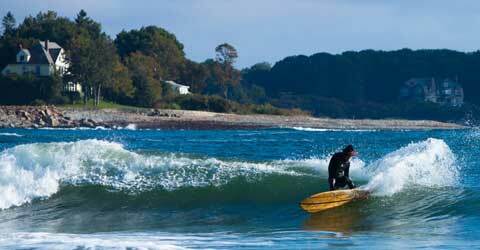 Began in the basement of a home minutes from the waves in York Beach, Maine. Mike LaVecchia combined his love of board sports with a passion for traditional wooden boat-building techniques to create works of art for riding waves. Brad Anderson joined as co-owner shortly after and, with the help of some friends, Grain has grown into a full-fledged surfboard manufacturer. Stated simply, we’re committed to building, promoting and riding surfboards that have less impact on the environment and more impact on your surfing. 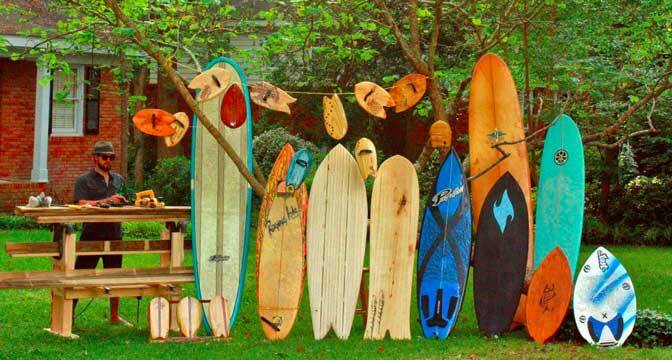 The Grain tradition includes reducing the impact of surfboard production by using locally harvested, sustainable-yield wood products, creatively reducing or reusing any waste left over, and developing techniques for employing greener materials. Tell us a little about yourself. What is your background? I was born in Baltimore and spent summers growing up in Ocean City Maryland. I moved to Rhode Island to attend the Rhode Island School of Design in 2000. I started shaping boards while I was still a student in 2002 and was hooked on the experience of shaping and riding my own boards. I kept shaping more and more boards for myself and eventually friends were asking for them too. I was turned off by the negative environmental aspects of the polyurethane foam and resin though. I began to look for more sustainable means to shape boards while maintaining a high performance standard, and being an artist the aesthetics of the boards is important to me too. What’s next for Kevin Cunningham and Spirare? I’ve been working with reclaimed found marine debris lately. I am currently using fishing nets and lines that wash up on the beach to make fins and accessories. It’s amazing how much trash you can find on the beach when you start to look for it. I hope to develop more uses for this material in the coming months too. Other than that I’m going to keep shaping as many boards as I can and push the performance of my shapes as far as possible. You had me at Baltimore…and the wealth of ocean trash. So far I’ve found a kayak paddle, three leashes, wetsuit, several sand-toy sets, and a nail file – Ocean Recycling! 1st place in Greyscale Gorilla’s 5-Second Project contest under the Monster Bash theme. My animation is a 5 second story about a little vampire that comes to life in paper and gets bashed with a poetic wooden stake – a pencil.